Rooms Ciencias i Valencia, Spanien : Boka nu! Reservations may be cancelled without charge until 24h before the day of arrival. If the reservation is cancelled during this period we will charge the amount of the first night. Shall be excluded of this conditions all the reservations with special restrictions, they will apply the according conditions. the full amount of the reservation. Le recordamos que la hora de salida es a las 12.00 hs. En caso de salida tardia o salida anticipada a su fecha prevista le sera aplicada una penalizacion. Le informamos que existe un cuarto de consigna de equipajes a su disposicion. We remind you that the check-out time is up to12:00 hs. In case of late check out or an early departure previous to the departure date, a penalty fee will be applied. We would like to inform you that we have free luggage storage service. Las habitaciones deben ser entregadas en las mismas condiciones de limpieza que fueron entregadas. Si las habitaciones no cumplen esta norma tendrán un cargo extra por valor de 30 euros. The rooms should be returned in similar conditions of cleanliness as they were delivered. 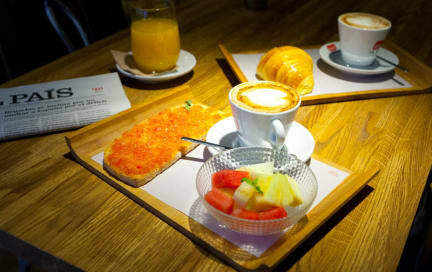 If the rooms do not accomplish this rule will have an extra charge of 30 euros. Las sabanas y toallas se cambiaran cada 3er. día. Linen and towels are changed every 3rd. day. Los ruidos molestos que afecten tanto a otros clientes como a vecinos pueden ser multados por la ley local por ser zona residencial. En caso de denuncia o quejas, el hotel puede exigir el abandono del establecimiento sin posibilidad de devoluciones. Noises that disturb other guests or neighbors could be fined since we are in a residential area. In case of complaints the hotel could ask to abandon the establishment without refund. Modern rooms decorated with natural tones, all of them exterior, with plenty of natural light most of the day, creating an elegant and quiet atmosphere that will make your stay even more pleasant. 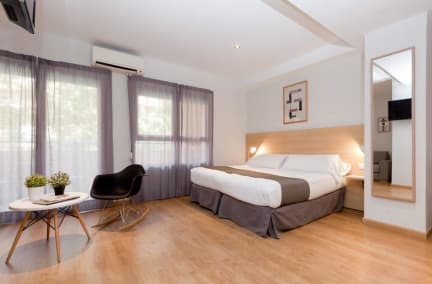 Rooms Ciencias is located in a privileged position, 100 meters from the City of Arts and Sciences and the old Turia River where you can enjoy its gardens. Rooms Ciencias daily rooms offers 30 spacious rooms, all with natural light and exterior, featuring a sober decoration and beautiful textures in natural tones, private bathroom with shower, hairdryer and amenities, TV LED 32 “, air conditioning, heating and free Wi-Fi. It is important to take in account that this property doesn't accept stag/hen/bachelor parties and students groups reservations.